Centrifugal Blower Market size was over USD 3 billion in 2017 and is projected to expand at over 4% CAGR over the forecast timeframe. Rapidly industrialization & urbanization has triggered the construction industry in Asia Pacific, which will have subsequent positive impact on the centrifugal blower market size during the forecast timespan. For instance, Asia Pacific construction industry is projected to witness gains of more than 7% over the forecast spell. The above-mentioned trends will drive product demand across cement plants and steel plants. Product is widely applicable across cement plants for removing waste gases and re-circulating air. Additionally, high pressure blower are used in the blending and storage area, conveying raw materials, additives, and chemicals used in the cement manufacturing gases. Product is extensively used in transporting hot gases produced during the processing in cement plants. Strong cement demand in Asia Pacific for building & construction activities will have positive impact on the centrifugal blower market size over the forecast timeframe. Asia Pacific government has been making substantial investment in major construction projects to boost economy. According to the Union Budget 2017-18, a total of USD 58.64 million has been allocated to infrastructure projects in India, which will have positive impact on the cement demand and henceforth will make notable contribution to industry size in the forecast timespan. High production and maintenance cost is likely to hamper industry size in the forecast timespan. High product cost is attributed to its ability to achieve the desired pressure based on the specific requirement. However, companies are making substantial investment in their R&D facility to develop cost-effective and low noise products which can optimize the overall processing. This has led to development of oil free centrifugal blower which are more energy efficient and are easily serviceable. High pressure centrifugal blower market share led the overall demand and accounted for more than 55% of the global share in 2016. High pressure centrifugal blower can generate pressure up to 35,000 Pa. These blowers are ideal for high resistance operations which can only be overcome using high pressure. They are mainly used across cement plants, steel plants, mining, pulp & paper and chemical industry. For instance, in chemical industry, they are used to exhaust corrosive, high temperature or hazardous gases from plants. Wide-ranging high pressure-based product use will help generate promising gains to the overall industry size in the coming years. Centrifugal blower market share for mining industry accounted for more than 15% of the global share in 2017. It finds wide-ranging applications for ventilation, cooling or exhaust gas system in mining industry. These equipment helps in blowing the air into ducts, tunnels, and underground passages. Strong product demand across U.S. mining industry will help generate significant gains to the overall industry size in the coming years. According to the U.S. Geological Survey, the country produced an estimated USD 74.6 billion raw mineral materials in 2016 which is a slight increase from 2015. These trends are likely to continue, which will help make noteworthy contribution in market size in the coming years. 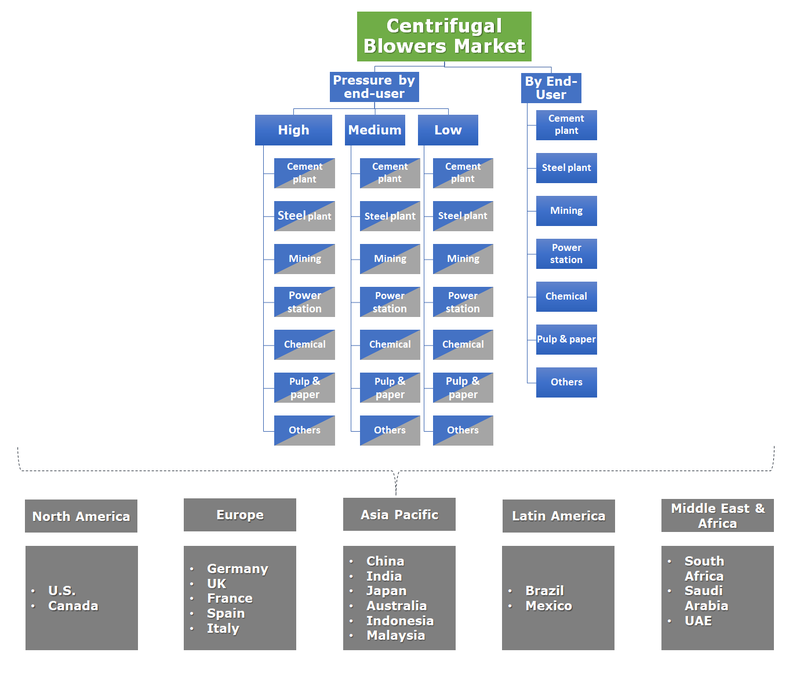 Europe led the global centrifugal blower market share and accounted for over 30% of the global volume in 2017. The regional growth was primarily driven by positive growth in the end-user industries including mining, power, pulp & paper, chemical, etc. Rising demand for power generation in the region from industrial and household sector will trigger the product demand, which will help attain promising gains to industry size in the forecast timeframe. Europe economy boost has led to a positive impact on its power demand, which will boost the centrifugal blower market size in the coming years. Low and medium pressure centrifugal blower are used for supplying air for fuel combustion and furnace temperature maintenance on power stations. Centrifugal blower market share is highly fragmented owing to the presence of several small and medium scale manufacturers. The leading contributors are: Atlas Copco, KAESER KOMPRESSOREN, Alfotech Fans, Airmake Cooling Systems, CLEANTEK, HSI Blower, Atlantic Blower, HSI Blower and Aerotech Equipments and Projects Pvt. Ltd.
Key industry players have been making substantial investment in its R&D facilities to expand its product portfolio to fulfill the changing customer’s preference from several end-user industries. For instance, Atlas Copco launched a new addition to ZS range of more energy efficient blower. Centrifugal blowers are widely used in ventilation system to transport gas and control air pollution. These blowers are also capable of changing the air flow direction by turning 90 degrees and speeding up before exiting the blower. They are widely used across cement plant, steel plant, mining, power station, chemical, pulp & paper, food and textile industry. Strong product demand in the above-mentioned end-user industries has been the prime growth factor in the recent years. 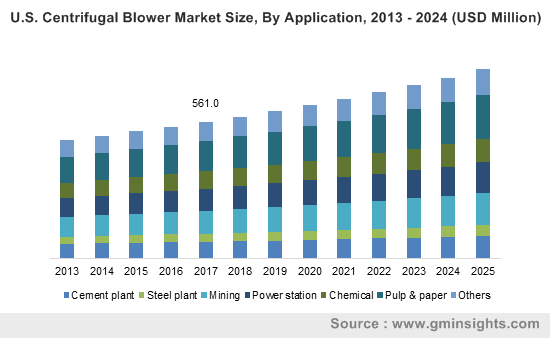 Rising product demand from mining and power industry in the U.S. and Europe will act as a major contributor to the centrifugal blower industry size in the forecast timeframe. Furthermore, rapid rise in construction industry in Asia Pacific and the Middle East will trigger product demand across cement and steel plants which will have subsequent impact on market size over the projected time spell.